Chris was appointed Associate Audit Director in January 2019. 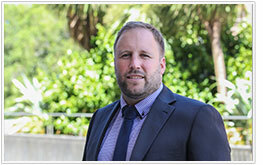 Chris joined us as a graduate in February 2008 and has worked mainly at our offices in Palmerston North as well as on audits throughout the country. His clients have included: local authorities and subsidiaries; tertiary education institutions; energy companies; Crown entities; and airports. Chris has more than 11 years’ experience as an auditor. local authorities and their subsidiaries.